Part of the original 600 acres of William Bucklin was used in later years for a mill, which became the start of the merchant businesses of Joseph Bucklins 3rd and 4th. Present day view of the dam. Slater Mill on the right. The church on the east side of the river stands on land of the Bucklins in 1772. You may click on this map of the original Bucklin lands (as they were divided among Bucklins in 1755) in Pawtucket to enlarge it. The 1747 grist mill of James Bucklin stood on the river bank, just south, and next to, the bridge to Providence. 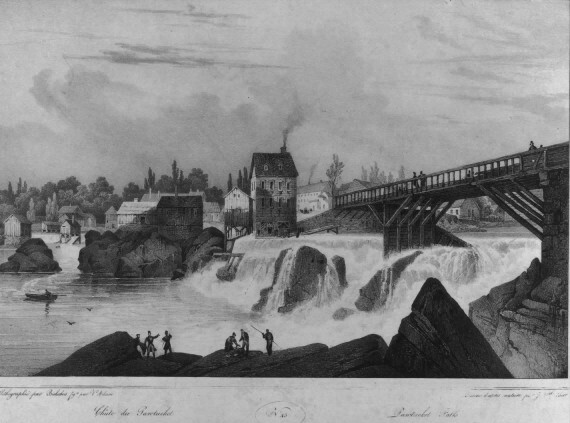 The French Revolutionary War era artist making the engraving below, for a French magazine, viewed the bridge from about about the location of the grist mill. The junction of the Road to Boston and the bridge across the river at Pawtucket, where the road led on to Providence, was a good location for merchants. This was Bucklin land from the beginning of the town of Pawtucket. But during his lifetime William gave deeds effective upon his death, dividing his land in thirds. The northerly third went to son Joseph. The middle third son Benjamin. This middle third contained the falls property. The southerly third went to William’s wife as long as she lived, with the land to then go one-half to each of Joseph and Benjamin. Benjamin died before his father, and eventually the heirs of Benjamin grew up and moved out of Pawtucket. In 1696 they sold the northerly half of their land to the Smith family, and the southerly half to Joseph (who had inherited all the land of his mother at her death because of the prior death of Benjamin). Thus the falls area on the east side of the river passed out of the control of the Bucklins into the Smith family. After their 1696 purchase of the land from Benjamin Bucklin’s heirs, the Smith family apparently built a Corn (aka Grist) Mill with the help of the Jenks and Slater families who were operating a mill on the other bank of the river. 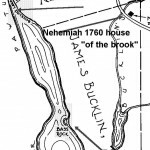 With the exception of the 1/2 of 1/3 of the original William Bucklin 600 acres which passed to the Smith family, the remainder essentially remained in one ownership, from Joseph 1st, to James 1st to James 2nd, and then to James 3rd. James Bucklin 2nd, born 1709 (husband of Mary Fields), recognized the value of turning from agriculture to manufacturing. 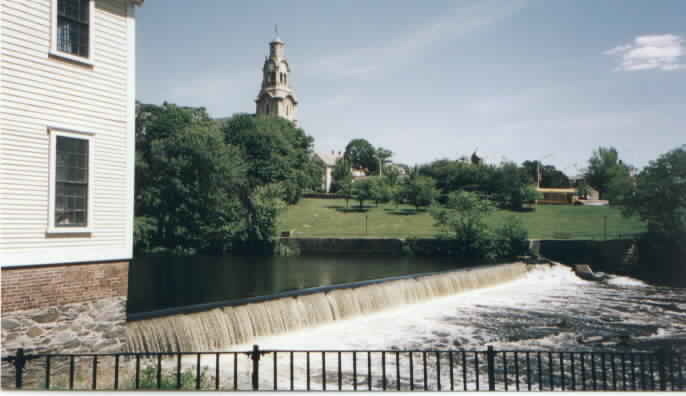 James 2d in 1747 commenced the purchase of the Smith’s Corn Mill on the east side of the Pawtucket Falls in Rehoboth, Province of the Massachusetts Bay. He purchased one-half from Samuel & Experience Smith, one fourth from William Jenks of Providence and the final one-fourth from Ebenezer Jencks of Providence in 1750. His purchase papers show he purchased not only the mill itself on the east side of the river, but also the appropriate river mill rights and the land on the east side of the river. In addition to purchasing the mill and water rights at the falls at Pawtucket, James 2d purchased a tract of land of 200 acres on the entrance of a small river into “The Cove” on the Seekonk River. This new land adjoined the original Bucklin land on the south. Here James 2d built a mill. In this way, James 2d effectively became the owner of all the effective river power on the east side of the Seekonk River. At about the same time, James 2nd’s cousin Joseph Bucklin 3rd (1694-1776) was smitten with the same idea of to buy more land for mill purposes. This idea may have originated because Joseph Bucklin 3rd married to the daughter of William Jencks, the family with the Jenck’s mill and businesses on the west side of the river. It would be speculation, since there is no documentary evidence, but it would seem that the Bucklins, who until that time used their land for agricultural income, received technical advice from the Jencks. (Joseph 3rd’s father in law was the same William Jencks who was a part owner of the mill on the east side of the river and sold it to James 2nd.) Joseph Bucklin 3rd left the land he owned adjacent to the newly purchased mill land of James 2nd (selling his Pawtucket area land to James 2nd) and went west 16 miles to buy land on a river south of the so-called Hope Furnace operation of the Jencks and Browns. This land, in Coventry, Rhode Island was used by Joseph Bucklin 3rd to build a mill used both for corn grinding and also manufacturing. Joseph Bucklin 3rd, who died in 1776, was the father of Joseph Bucklin 4th, (1730 – 1790), the prominent merchant of Providence. This explains why before he was 29 years old Joseph Bucklin 4th had cash enough to buy substantial land, and a ship, and operate a merchant business in Providence. It might be noted that because of the Jencks family mill ownership and the Bucklin family ownerships, at the start of the Revolutionary War, the few river mills in Rhode Island capable of doing manufacturing, and thus being able to mill iron rifle barrels or such, were effectively concentrated in the Bucklin and Jencks families. Other than the mill property owned by his brother John, James Bucklin 3rd held all the land on the east side of the falls. Unfortunately, in about 1791, he died unexpectedly at age 48, leaving a large family. The widow sold the land at auction, and it was broken up into several parcels which became the sites of new power loom factories of the new cloth manufacturing industry. This auction was the end of the large contiguous Bucklin land holdings in Pawtucket. In July of 1792, Oziel Wilkinson, one-third owner of the Slater Mill on the west side of the river property and water rights, and Almy Brown and Slater, owners of the other two-thirds, obtained financing from Moses Brown, and initiated the construction of a dam spanning the width of the Blackstone River upstream from Pawtucket Falls. Slater had recognized the value of building a dam upstream of the falls and diverting a more powerful stream of water (because of the greater height the water would fall before it hit his water wheel) into a new channel to be used only for the mill operations on their (west) side of the river. The Wilkinson/Brown/Slater combination purchased some appropriate rights from the Bucklins on the other side of the river to build their dam (see Note 4, below) and attach it to the land there, but did not purchase any rights from the Bucklins downstream who were at the main falls. Although the dam inspired admiration, it also created resentment from others who had water powered machinery at the main falls. On August 31, 1792, John Bucklin, (see Note 2, below, indicating this was John Cumberland Bucklin) and blacksmiths Stephen and Benjamin Jenks partially destroyed the dam. All three men asserted they had water privileges at the main falls downstream and complained that the dam construction diminished available water power. They all admitted their guilt but justified their actions by claiming water rights to the dam below. A legal battle followed. Bucklin won. See Note 5, below. Even before the case was heard, Moses Brown financed the rebuilding of the Slater Mill dam. In response Bucklin built a diversionary dam wing into the river, below the Slater Mill dam and above the falls, with a channel to run water to his mill. This created a backflow toward the Slater Mill’s waterwheel and impaired its operation. Local farmers now added their complaints about the dam building, and fishermen added their complaints about the lack of fish ladders and the inhibition on migrating fish upstream. In March 1793, the Assembly directed the Slater Mill to remove twenty inches of height from its dam, ostensibly to facilitate fish migration. This had the effect of making Bucklin’s diversionary dam wing unnecessary to operate his mill, and all ended happily, except for Moses Brown having somewhat less later power for the Slater Mill. [sic] Jr. and his Purchase of a Corn Mill On East Side Of Pawtucket Falls as follows. James3 Bucklen Senior died in Rehoboth, Province of the Massachusetts Bay on 9 September 1738. James4 Bucklen Junior was the sole executor of the will. NOTE 3: The general location of the grist mill property and the home nearby is now occupied by a creamery (that serves delicious ice cream). To find the place just go to the Main Street Bridge, to the East side of the Bridge and there you are! NOTE 4: In a land agreement between Ebenezer Bucklin (who was on the east side of the river at the upstream dam, and Stephen, Benjamin Jenks (downstream blacksmiths) and Moses Brown, filed at Bristol County Registry of Deeds, Vol. 72., p. 469, 8 Aug 1792, Taunton, MA. A dam was to be built “… about west from said Ebenezer Bucklin’s Dwelling House in the Township of Rehoboth aforesd and about one hundred and twenty rods above Pawtucket falls.” Rights to the water power from the dam were adjusted and memorialized by this agreement.